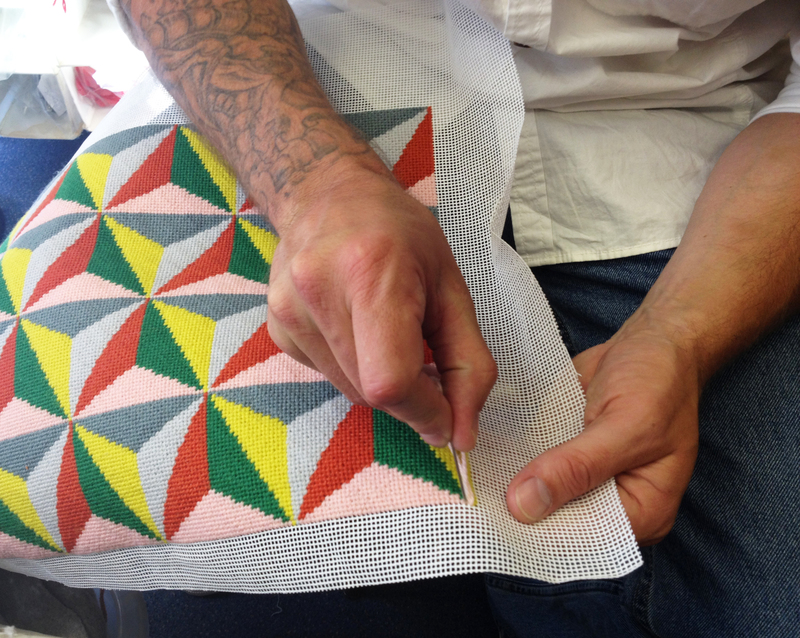 Based on the very simple premise of teaching prisoners to sew, it began in 1992, after decades of increasingly robust campaigning by Lady Anne Tree, lifelong prison visitor and wife of Michael Tree, son of interior designer Nancy Lancaster, founder of Colefax & Fowler. Finally give the approval to proceed by John Major’s government, the scheme was intended to allow people to finish their sentences with “skills, savings and the self-belief to not re-offend”. A Fine Cell Work stitcher working from his prison cell. Showing the complexity of the work they learn to do. But it’s about so much more than just smart sewing. The FCW initiative works on many restorative levels: it establishes and reinforces not only work skills but also life skills, relationship skills and mental resilience. Prisoners are taught by experienced volunteers to work independently in their cells or in prison workshops, which in turn helps them to regain control of their lives and achieve a degree of dignity. Finally it enables them to earn an income as they’re paid for each piece that they make, these being subsequently sold – interestingly, it was the issue of payment that first caused the fuss when Lady Anne initially proposed the idea in the late 60s; at the time it was felt that this was akin to permitting prisoners to profit from their crimes. What’s truly remarkable though is the cumulative emotional effect of such endeavour. Here’s a quote from one of the stitchers, as the prisoners who sign up for the scheme are called… “Because of Fine Cell Work it has been over six years since I self-harmed. I have no mental health problems now and it has made me a better person.” Many of the other quotes I read literally moved me to tears. 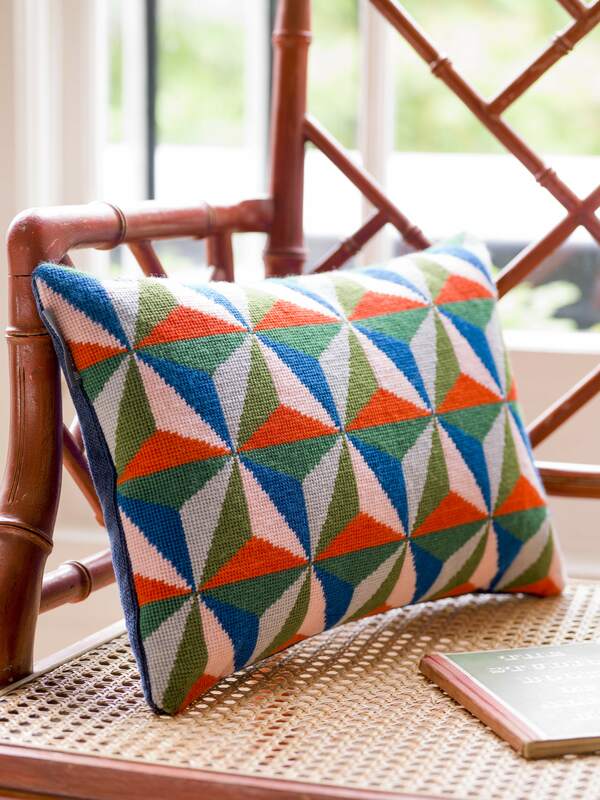 A Fine Cell Work cushion, designed by Pentreath & Hall. 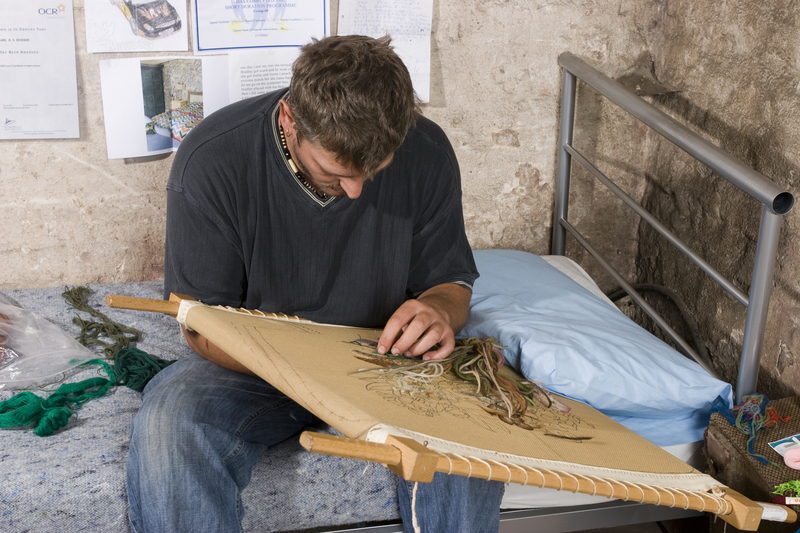 It’s also about commitment as stitchers spend on average about 24 hours a week sewing, and any one of the cushion designs is about 150 hours work and a kingsize bed quilt might take between one and two years to complete! They also get a sense of connection to the outside world as all pieces have to be finished to sellable standard and they’re retailed in shops from Liberty and Colefax & Fowler, to the Fine Cell Work’s own online portal, with bespoke pieces commissioned from prestigious organisations such as the V&A Museum, English Heritage, HRH Prince Charles, Tate Modern and The Royal Academy to name but a handful. And this is no vanity project, the charity has some impressive statistics too. 94% of the stitchers are men, although the scheme is open to all genders. 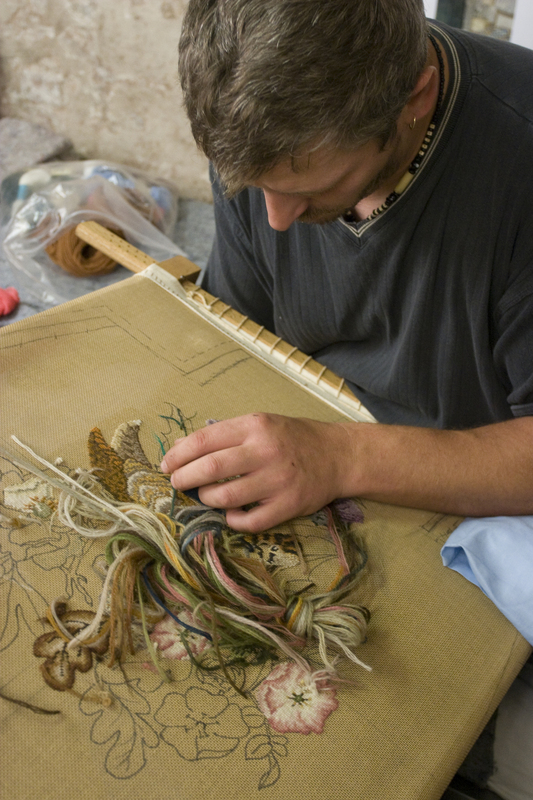 Approximately 20% of the stitchers are aged 35 and under. And to date, the re-offending rate of FCW’s post-prison trainees is just 8%. Compare this to the national average of 46%! 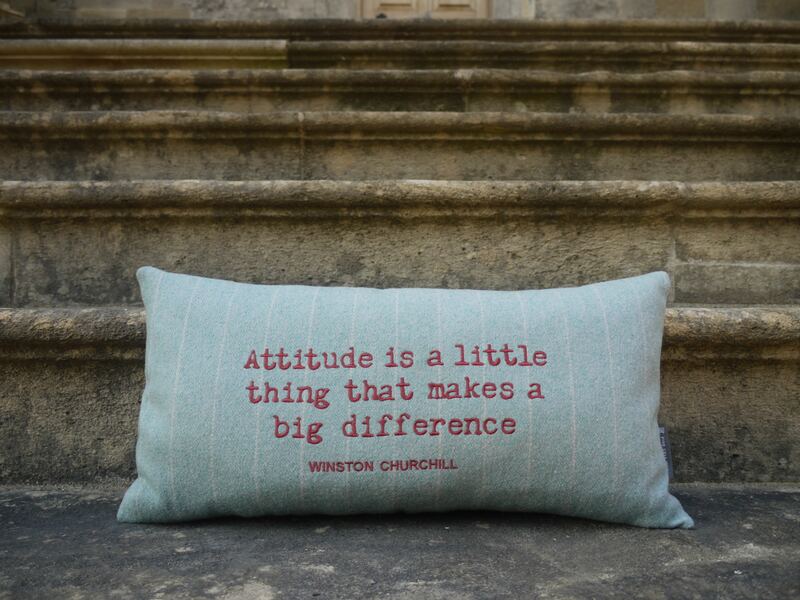 A Fine Cell Work cushion featuring a very apposite quote from Winston Churchill. Oh, and did I mention that the finished designs are beautiful too! There’s a huge array of things to buy, and some designs are the results of collaborations with designer names like Stella McCartney, Cath Kidston, Ai Weiwei, Ashley Hicks and Celia Birtwell. And there are great kits that you can buy if you want to have a go yourself; take a look here. On Tuesday 13th March I was In Conversation with Katy Emck OBE at Liberty London in the wonderful Haberdashery department on 3. If you missed this, not to worry because it’s now available on the Liberty London podcast. Click here to hear! This was one of a series of events staged as part of the ‘Women of Liberty’ campaign, championing Liberty’s edit of remarkable female pioneers — Katherine Hamnett, Anya Hindmarch, Katy Emck, Florence Welch, Stella Jean, Elise Valmorbida, Loretta De Feo, and Gal-dem. Check out an exclusive Wishlist of Liberty pieces chosen by these remarkable women here. And read the full transcript of Lady Anne Tree’s obituary in the Guardian, source of my quotes. Blog post by Katy Emck OBE.